DTA3050 - ASI multiplexer with 5 (or 10) ASI inputs, ASI and IP outputs | AdvancedDigital Inc.
Digital television service operators wishing to aggregate and process MPEG, ATSC, Digicypher, or DVB based services for traditional (satellite, cable, terrestrial) services will find the DTA ideal. It boasts 10 ASI inputs. Each supporting wire speed, a three-way mirrored ASI output, GIGE, and optional SMPTE-310. Redundancy for ASI and SMPTE-310 is supported with an intelligent built in relay-bypassed switch. The DTA-3050 is IPTV and BBTV ready today, it supports multicast and unicast configurations including SPTS/UDP, MPTS/UPD, MPEG and DVB tables. Encryption support includes DVB-CSA with Ethernet Simylcrypt, AES for use with Simylcrypt compatible Conditional Access management Servers (CAS) vendors. The DTA 3050 is ideal for traditional and next generation television networks. DVB-CSA: Encryption Algorithm feature for DTA’s. Capable of encrypting 210 Mbs and is supported via ASI and IP egress. DVB-AES: AES Scrambling Algorithm feature for DTA’s. Capable of encrypting 210 Mbs. Used for IPTV with Verimatrix server. Conditional Access:The DTA-3050 provides DVB-CSA and BISS encryption and AES conditional access encrypt capabilities. DVB-CSA encryption is available as fixed key BISS or Simulcrypt based interfaces compatible with most major DVB-CSA CAS vendors. AES encryption includes support for Verimatrix VCAS for residential set top and computer-based decryption. ASI:Three port mirrored ASI output interface provides integration with traditional distribution methods including Cable, Satellite, and Terrestrial. 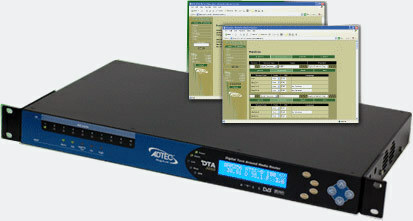 Flexible Configuration & Control:Controlling and configuring the DTA-3050 is easy. Whether using the integrated front panel keypad and LCD, Terminal or remote Web page interface. DTVGuide:Create and upload your own program listings for distribution over ATSC, DVB, and IPTV applications using our web-hosted DTVGuide electronic program guide generator service. A very economical way to instantly begin sending EIT data, DTVGuide requires no additional equipment when paired with the DTA and its built-in EIT injection carousel. The DTA fetches EIT data which has been uploaded to DTVGuide over the internet, and immediately begins to inject the data into the transport stream.